Posted on April 13, 2016 by Mike Sonnenberg Posted in courthouses	. I am never really sure which photos to post and when, but then sometimes there are outside forces at work telling me what to post. When I was traveling thru Sandusky on M46 the other day, the sun was shining on the old courthouse, and it was perfect for a photo with the green grass and blue skies. 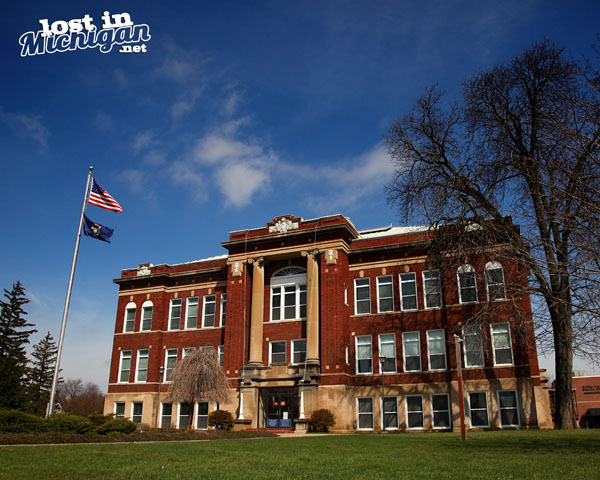 Then this morning I saw this story about the Sanilac County Courthouse turning 100 years old, and since I just took a photo of it, I think today is a good day to share that photo.